We (truthfully, my husband) turned a 100 centimeter (39+”) Glimåkra Ideal loom into a 70 centimeter (27+”) loom by creating all new horizontal pieces. 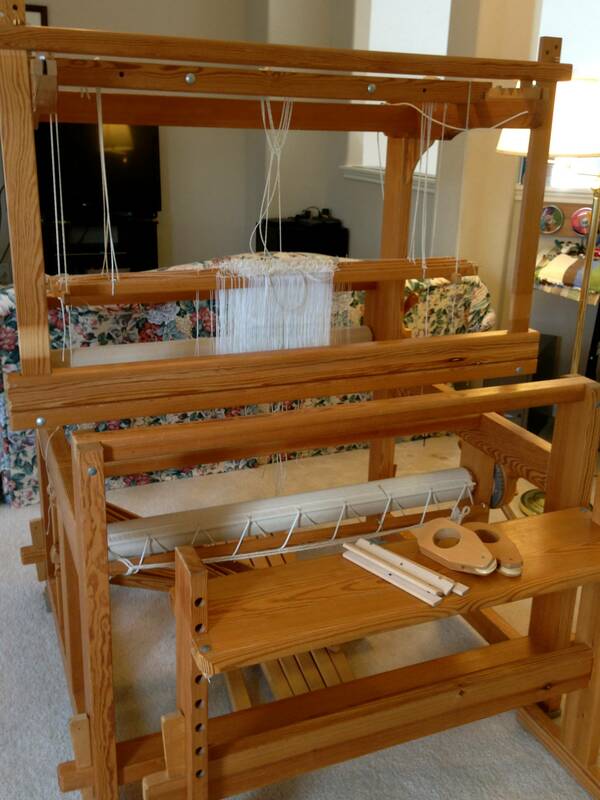 I can select either size loom–it is convertible! I plan to use the 70 centimeter loom for workshops, since I am able to break it down with a warp on it and and set it back up. Singlehandedly. Not kidding! Steve spent hours of measuring, cutting, creating, and fitting. All in a hot Houston garage. A lot of love went into this cute little loom. Here’s our story in pictures. Steve started with the most challenging part, the octagonal cloth and warp beams. One end is precisely shaped to fit into a round hole on the side of the loom; the other end also has the round shape, but then is squared to fit exactly into the turn handle, with a rectangular hole for the wedge that holds it in. Whew, he did it! After making all the beams, Steve said this horizontal countermarch mechanism was a piece of cake. New pieces for the 70cm loom being added: treadle beam at the back, foot beam at the front, and upper and lower lamms in the middle. No need to replace the treadles, seen on the floor in front of the old 100cm treadle beam. Last step before putting a warp on the cute little loom. 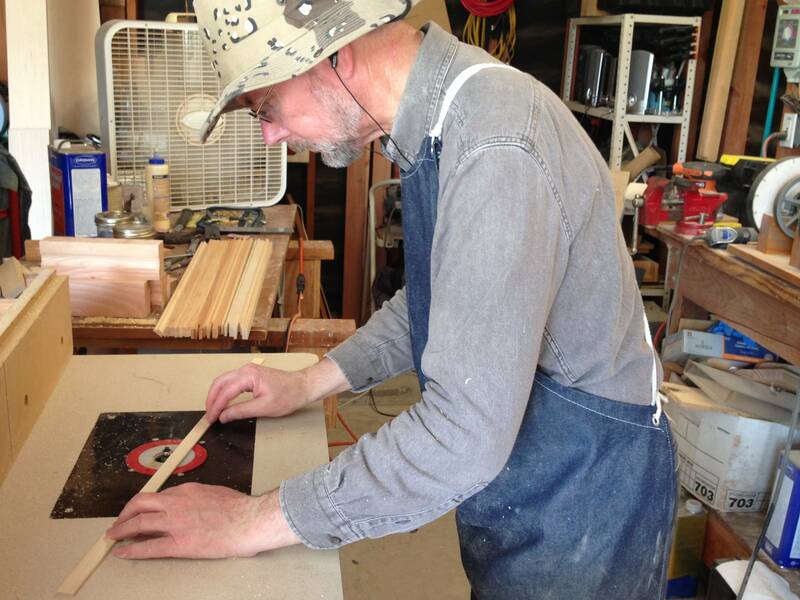 With classical music in his ears, Steve is making 70cm slats to use for warping. The hat is to keep sawdust out of his hair. The fan is to keep him alive. For the first warp, I used a simple plain weave draft from “Simple Weaves” (Nya Vävar) by Björk and Ignell, p.22, just long enough for two small rag rugs. This first rug, Lime Green and Blue Stripe, is happy proof that everything works! Loom is reassembled (took me 28 minutes, 30 seconds) and Red Flame rag rug is in the making. The cherrywood ski shuttle is another one of Steve’s lovely creations. 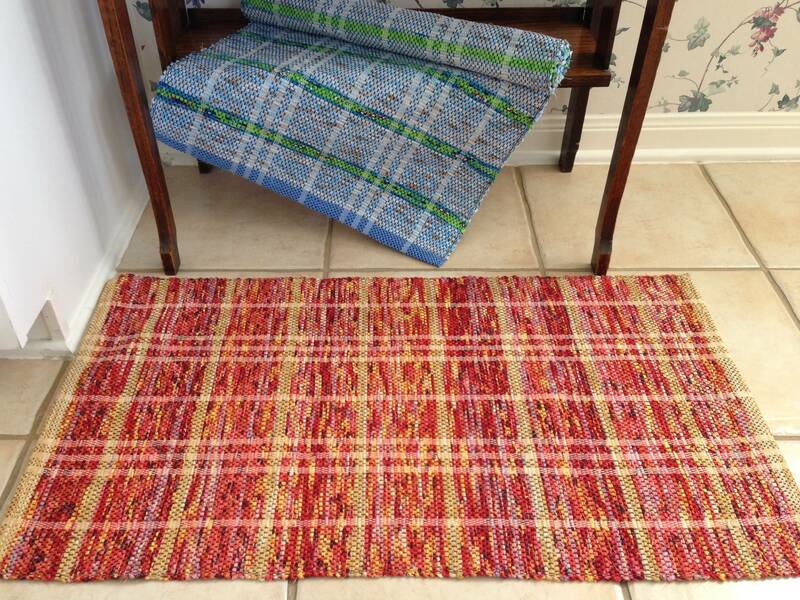 Two simple rag rugs, a test for this old-new loom. This cutest loom ever passed the test with flying colors, and oh so much love! May you enjoy a quiet day of love – some old, some new. Gret, you made me smile! Thanks! All I can say is wow! Great idea and well done both of you. Thanks, Sandy! Your cheerleading means a lot! I plan to start winding a new warp for the loom today. Good times. LOVE: You two are a team! Yes we are, Betty. I love that compliment! Thanks! Ha ha, well I’m certainly not anonymous. Now I know what happens if I try to reply from my iphone. I agree with Betty. WHAT a team! God really did a work when he put you two together. Beautiful loom, beautiful rugs, beautiful couple! Thanks, Bev! What a lovely thing to say. I can’t disagree with you. Steve and I were most certainly meant for each other! Ideal. Wish I had the woodworking skills to make it convertible! Diane, thanks for taking time to leave a comment! I owe a lot to my hubby. This couldn’t have happened without him. My woodworking skills are zilch. How nice that you have restored an Ideal! I’m sure it will serve you well! Fran, I understand your question. 70 cm IS small for making rugs. Normally, I do rugs on my 120 cm Glimakra Standard. The only reason I wanted to make the 100 cm loom smaller was so I could use it as a workshop loom. 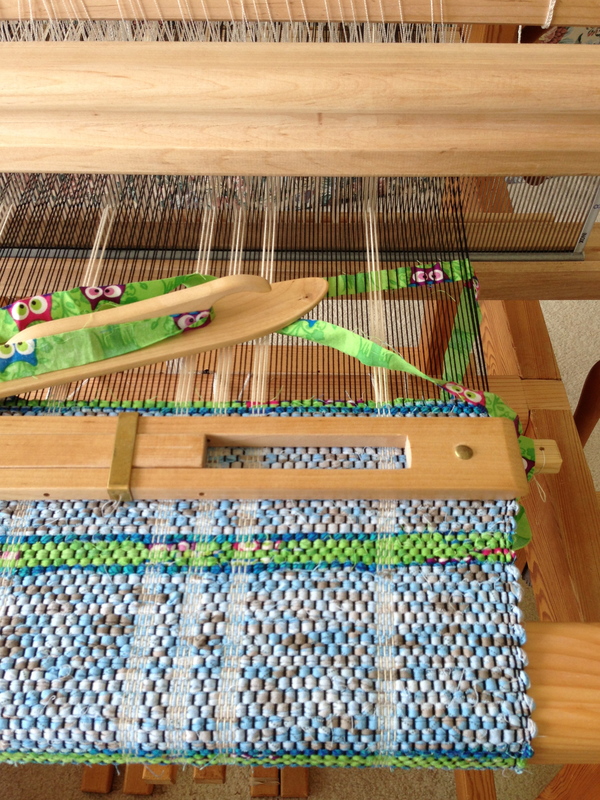 I don’t expect to make many rugs on this smaller size loom, though it is sturdy enough for it, and it did function very well for the Jason Collingwood rug workshop, where the warp was only 11 1/4 inches. 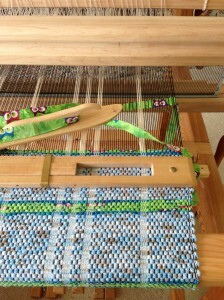 I have to say, though, I really enjoy weaving on this tiny loom. It will be perfect for weaving scarves, yardage for clothing (most pattern pieces are no more than 18″), and even kitchen towels. I’m glad you stopped by to ask a question! Kerstin, wow, I had no idea! That’s great to know. Now I can say I’m just following an old Swedish tradition. It does make sense, though, because it’s a very efficient use of materials and space, and the Swedish seem to be experts at that. I found your post while searching for a Glimakra in Houston and it’s made me look at listings for much larger Swedish style looms differently. Now that they’ve stopped making the Ideal this might be the only way of owning one of these perfectly sized Glimakras. Leesa, I’m glad you happened upon this post, then! There have to be some more Ideals around, but it’s not easy finding one. I hope you end up with what you’re looking for, even if you have to re-size something. That’s not exactly easy, either. But where there’s a will, there’s a way. Wow! Amazing! I had discussed this very thing with a weaver friend of mine, but neither of us is a woodworker. To me the possibilities are endless. I love the Glimakra Julia, and she is built with less timber, I had thought… what about an 18″ or 20″ Julia instead of a 27″ Julia? What about a 36″ Julia? Julia also has a design flaw, because the vertical beater supports are inside the frame, not outside, so the supports cut into the maximum weaving width. Just a modification of the beater, which really ought to be done, would need a skilled woodworker. I offer my deepest respect for your husband’s talents. If he wants to make some money for his handiwork, I would love to hire somebody to create a replacement beater for my Julia.. just like the old one, but with the vertical supports outside the warp area. 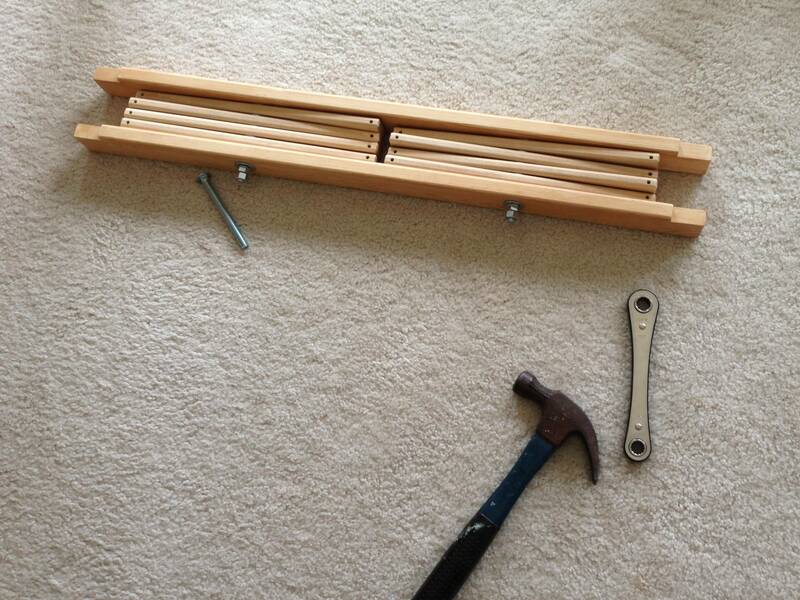 It’s amazing how simple, really, these Swedish looms are! I love the thought of a little bitty 18″ or 20″ loom. You could fit that into any corner of a room. The Julia, especially, is such a beautifully simple design. My husband has thought of trying to build one like it from scratch, with a few improvements. But that’s way down on the “someday” list. For now, he has a “real” day job; so, even though he would love to help you out, he doesn’t have the spare time to do all these wonderful things. But he does feel very honored by your kind complimentary words. Thank you. I love keeping up with your blog. 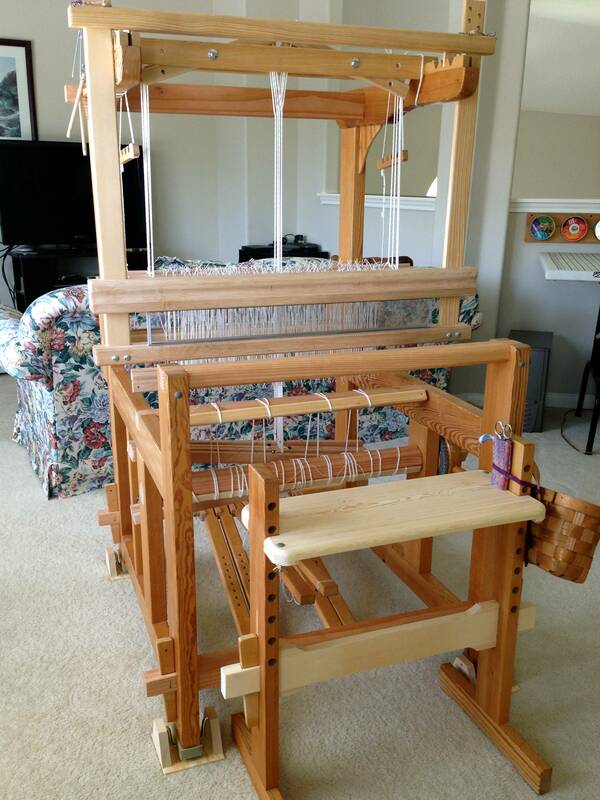 I have a Cranbrook loom and would like to add 4 more shafts. Can you tell me what kind of wood your husband used for your loom parts? Hi Betsy, I love having you along with me here. Steve tried to match the wood as closely as possible to what was on the original loom. He used pine for the lamms, and poplar for the shaft bars and countermarch jacks. He didn’t add any treadles, but he said if he did he would use maple, a dense wood. I hope everything goes well with expanding your Cranbrook. Exciting! Hi Karen…What kind of pine did Steve use? Hi Jane, Steve says it’s just pine he picked up at Lowe’s or Home Depot. He’s not so concerned about what type of wood it is, but how straight it is, how many knots it has, and how straight the grain is. 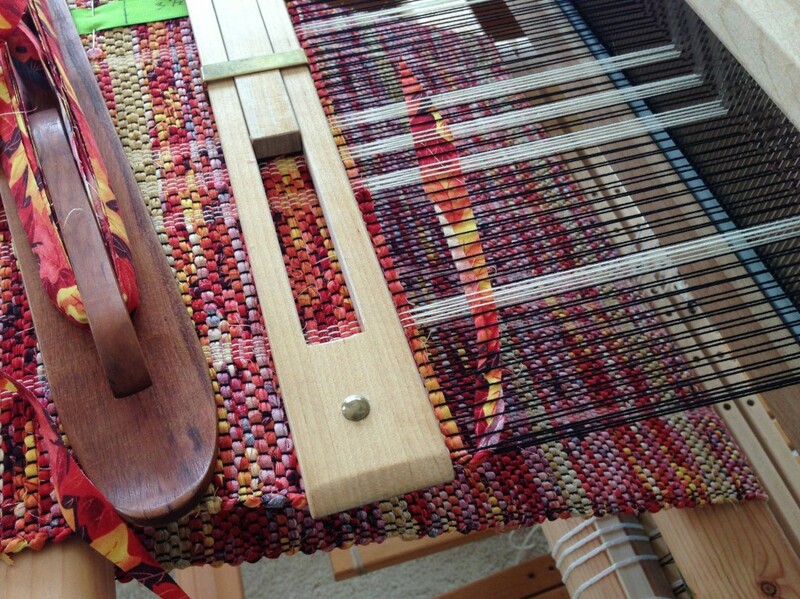 Love this post – and he even changed the bench to match the width of the smaller loom. 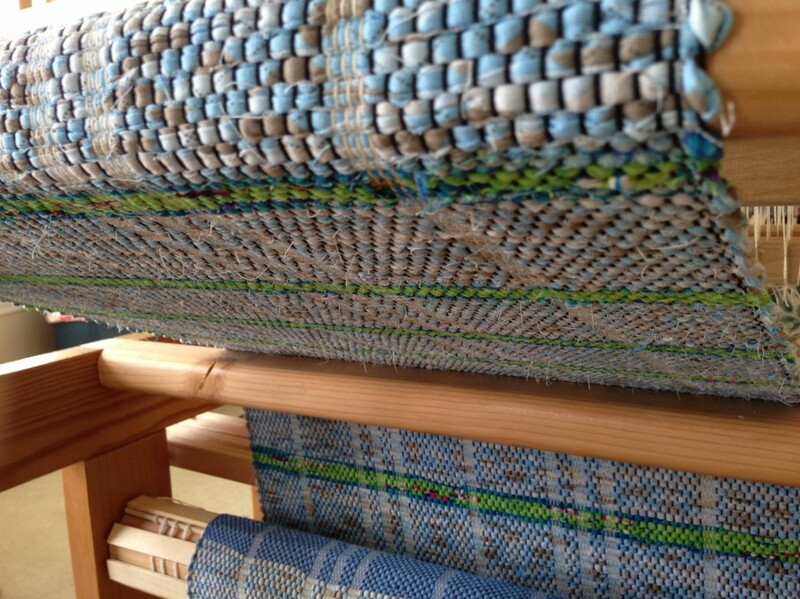 Vibeke, Yes, the loom bench in interchangeable, too! I’m glad you noticed. 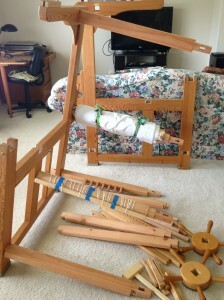 I loved reading this – I have just bought an Ideal loom and am amazed how easy it is to dismantle and put back together. If I had known this, I might have gone for a Swedish loom years ago! I had read that the only difference between the different widths is in the cross pieces, and the fact that the ratchets are a separate part makes it more do-able too. I doubt if I will do this (unless perhaps one day I move somewhere much smaller) but I do plan to add extra shafts at some point – mine came with 4, but with the countermarche for 6 and there would be room for 8. 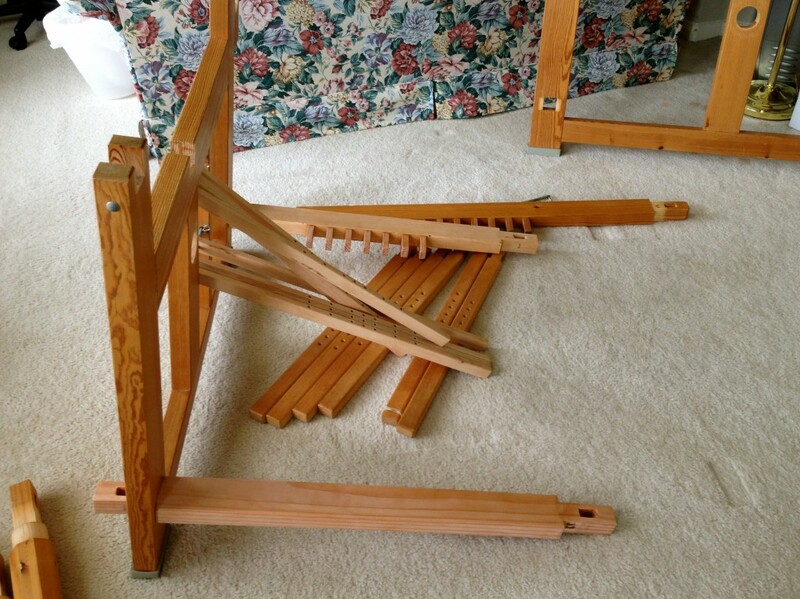 Hi Karen, It’s a great advantage that these Swedish looms are easy to dismantle and put back together! I’m sure you will enjoy your Ideal for many years to come. When you disassembled the little Ideal, did you also roll up the shafts and the reed in the bundle so you only needed to reassemble your loom and tie on at the class? Jane, That’s exactly what I did, and bundled it with the warp beam. I wrapped a sheet around the whole bundle and tied it with a few fabric strips leftover from rag rug weaving. It worked great. Feeling Empty or Filling Empty? This Swedish lace warp is finally cut off! The big loom now stands empty. I don’t like to let a loom stay naked for very long, so I will wind the next warp soon. That desire to keep the loom dressed will give me momentum through the finishing details and sewing of the dreamed-about curtains. Like this loom, we humans face times of feeling empty in daily life, and don’t like to stay in that unpleasant state very long. Cutting off the warp always feels like a celebration! Now I have a piece of fabric in hand to sew into curtains. Ta da! When we experience that feeling of emptiness, we try to find a way to overcome our bare state. We get super busy, stuff our life with things or food, or isolate ourselves to our own detriment. The good news is that we do not have to stay alone and empty. Amazingly, our creator desires to live with us, not just above us. And that is when our soul is filled–when we make room for our creator. And being filled, we say, Bring on the next warp! May your loom always be ready for the next warp. And, I like your saying: May your loom always be ready for the next warp! Great question, Irene! A few weeks ago I tried to find out why it is called Swedish lace, so I could put it in my Weaving Glossary, but I could not find an explanation in any of my books. So my answer is, “I don’t know.” It is called Swedish lace in The Big Book of Weaving by Laila Lundell, p.114 in the project notes, Plain weave and Swedish lace ‘mosquito lace’ block. I have no idea if this is correct but, for example, French lace is made using bobbins. 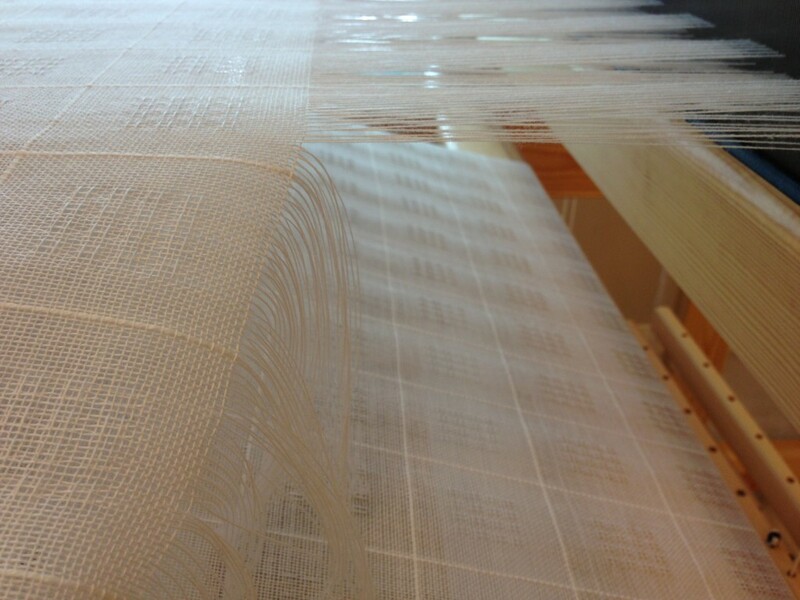 Swedish lace is made on the loom and weaving is so traditional in Sweden that it could almost be called woven lace. Hi Jane, That’s as good an explanation as any. Thanks for sharing! This old loom has been taken apart and put back together with all new horizontal pieces. Not a refurbishing, per se, but a new edition of a vintage model. 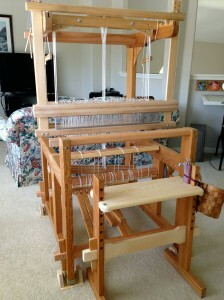 My genius husband has refashioned an old 36-inch Glimåkra Ideal loom, down to 27 inches. It is still an old a vintage loom, but Swedish looms are built to last; and this little pieced-together handiwork will surely outlast me. We humans have a lifespan, and at some point we start falling apart little by little. An ache here, a memory lapse there, and before you know it, we see the end of the warp coming over the back beam. How will we retain our value when we are all used up and worn out? Our worth originates in the hands of the one who made us, not in our usefulness and ability. Our master weaver will never set us aside or abandon us when we finally become threadbare. In fact, he goes out of his way to notice those who are forgotten by everyone else. You will always be a special someone to your maker. May you carry your years with elegance and grace. Thanks be to God that He “is able to make all grace abound to you, so that always having all sufficiency in everything, you may have an abundance for every good deed.” (2 Cor 9:8) Without Him, we are nothing. God’s rich blessings to you, Karen! A simple solution for keeping the guide string out of the way when winding a warp: Eliminate the guide string! 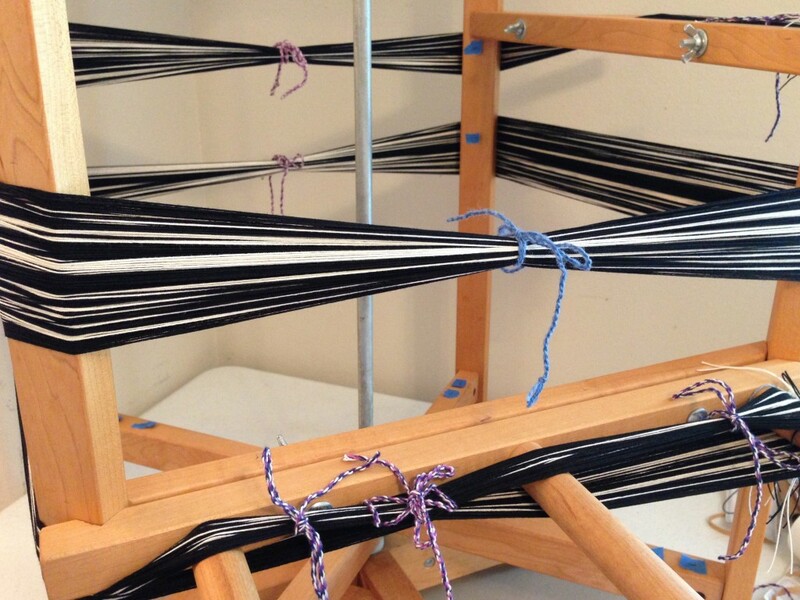 Okay, use a guide string, but not while measuring the warp. 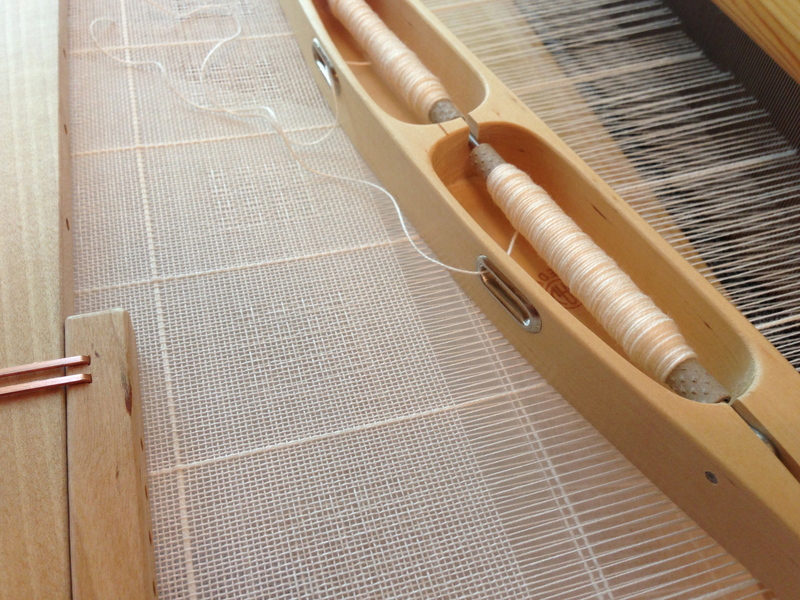 After I select the appropriate length guide string, I line it up on the warping reel. And then — this is the simple part — I place a little piece of blue tape (fold under one edge for easy removal) on the inside of each vertical post at the spot where the guide string passes. Remove the guide string and wind the warp, following the little blue tape markers! Simple. New rag rug warp for little Glimakra Ideal loom. Little pieces of blue tape mark the winding path for the warp. It is easy to complicate things. In my efforts to simplify, I occasionaly reach an impasse by trying too hard to get the perfect solution, and lose sight of the main thing. Talking with our creator is one of the simplest things we can do. When we get caught up with trying to say the right words, we can make it so complicated that we totally miss having the conversation. Simply saying what is on your heart touches our creator. And I’m convinced he bends down to listen …just like a father. May you find simple words to express your heart. Thanks, Karen. Sometimes I feel like I don’t know the “right words” to pray for a situation. I tend to look for formulas when I just need to speak what’s on my heart. And keep listening and learning. That happens with me, too, Barbara. We need to remember that our creator already knows our whole situation, and maybe he’s just waiting for us to talk with him about it. A great reminder….how often do we make things more complicated than they need to be…including prayer! The 8/2 cotton threads are doubled, and form an outline around the delicate 20/2 cotton threads, creating this Swedish lace. I see the 8/2 outline as a window frame around panes of glass. A repeating geometric pattern like this is a visual impression of the cycles that form our backdrop for life. The sun rises and sets; seasons follow their sequence; years come and go. Repeat, repeat, repeat. 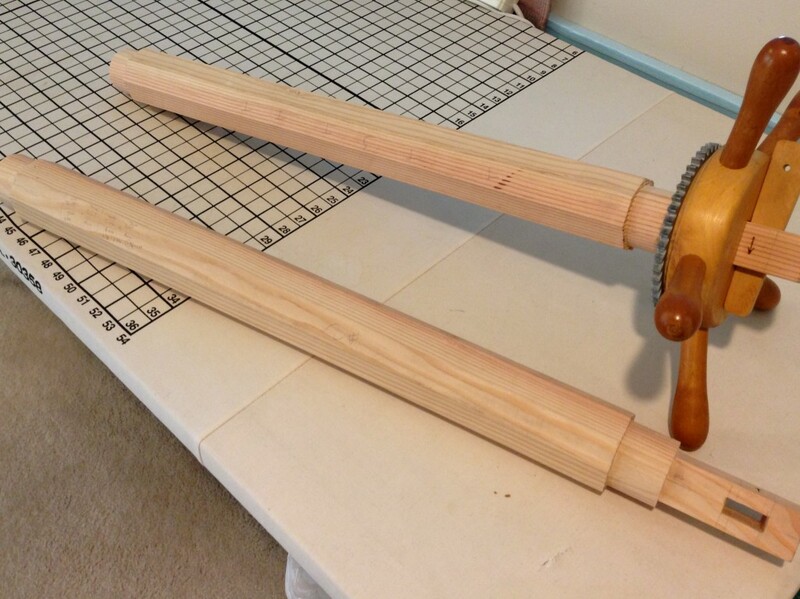 By using a double bobbin shuttle, the thicker outline threads are placed in the shed together without twisting. Life hands us constant changes, but one thing we can always expect is a new day. We have been given a lifetime of tomorrows. Even when we are not able to see the sun because of clouds, the sun still rises. In that consistency of tomorrow, no matter what the present day offers, there is a knowing that runs deep in every soul. In moments of solitude we feel it: The creator loves me. No matter what. New every morning. His mercies are new every morning. Great is thy faithfulness! Morning by morning new mercies I see. All I have needed, thy hand hath provided. Great is thy faithfulness, Lord unto thee! Bev, when I weave, I’m doing more concentrating than singing, ha ha. But that old familiar hymn certainly rings true. I never get tired of thinking about his faithfulness–through ages and ages of time, and his mercies–new every day. Old and new, perfectly combined.